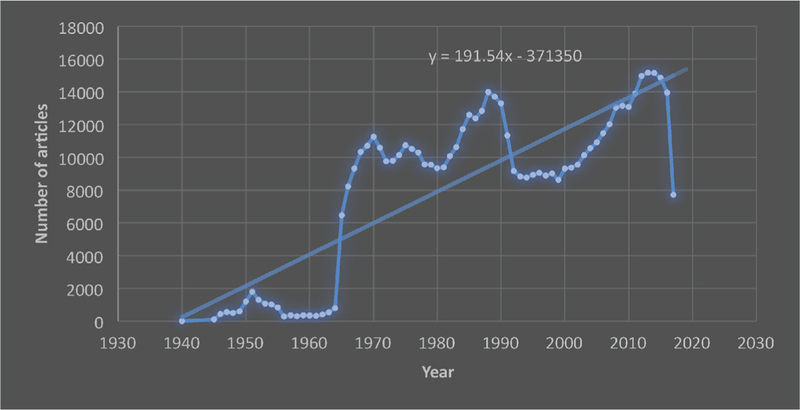 However, on October 12, 2016, we analyzed PubMed data and made a scientific forecast on dental research output within the next 20 years using exponential smoothing algorithm, an advanced machine learning algorithm. According to the forecast, number of 2017 dental articles must be more than 14,000, yet in reality number of article dropped to 7718 which involved only 385 clinical trial and 406 systematic reviews and meta-analysis [Figure 1]. The reasons for this dramatic drop are unclear for us, yet it needs more attention. Nevertheless, at 25 May, 2018, PubMed was searched via the query “2017/1/1”[PDAT]: “2017/12/31”[PDAT] AND jsubsetd[text] NOT "2018"[PDAT] to find all 2017 dental articles. PubMed records were visualized through VOSviewer 1.6.6 (http://www.vosviewer.com/, Leiden University’s Centre for Science and Technology Studies). Author keywords were used for science mapping through co-occurrence network analysis. A minimum number of occurrence of a keyword was set at 14 to include in the study. 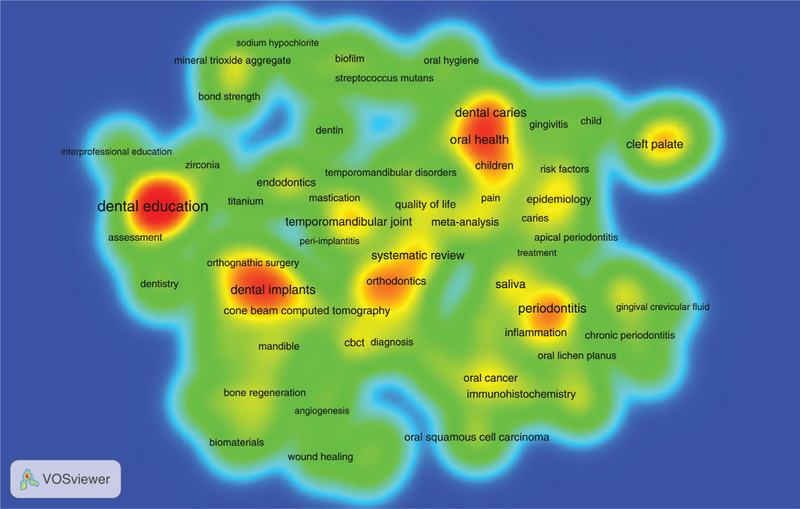 Among 90 keywords which met the threshold, oral health, dental education, and dental caries were the hottest topics among 2017 dental articles [Figure 2]. Khabsa M, Giles CL. The number of scholarly documents on the public web. PLoS One 2014;9:e93949. Jinha AE. Article 50 million: An estimate of the number of scholarly articles in existence. Learn Publ 2010;23:258-63. Global Scientific Output Doubles Every Nine Years: News Blog. Available from: http://blogs.nature.com/news/ 2014 /05/global-scientific-output-doubles-every-nine-years.html [Last accessed on 2018 Mar 25]. Kolahi J, Khazaei S. A scientific forecast on dental research output within the next 20 years using exponential smoothing algorithm. Dent Hypotheses 2017;8:3-7. Slater L. PubMed PubReMiner. J Can Health Libr Assoc 2014;33:106-7.